Having lost against Long Sutton in the Denny Cup, Sleaford men’s team played against Stamford in the consolation Denny Plate but were beaten 58-62, so their involvement comes to an end for another year. 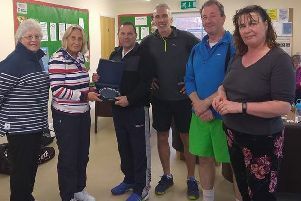 Champion of Champions Men’s singles saw David Bristow losing against Jonathan West (Boston) 9-21, while Anita Briggs had to concede her match to Jean Veal of Skegness in the Ladies’ Champion of Champions. In the National Men’s Singles, David Bristow has to travel to Skegness to play Jon Molson, Gareth Hubbard will play Paul Bark from Horncastle, and there is an all-Sleaford clash between Stephen Cornwell and Paul Oke. The one match played so far resulted in a 21-16 win for Paul Roberts against clubmate Trevor Bannister. In the National Ladies’ Singles, Gloria Davies will play against Jayne Taplin at the Sleaford club. Playing at Horncastle, Trevor Bannister and Richard Barnes had a close win against Tracy Nunn and his partner, 12-11, in the National Men’s Pairs. Paul Roberts and his partner are the other Sleaford representatives in this event and will play against Ian Clark and partner from Boston. Paul Oke is due to play Jonathan West in the National Under 25 Singles, with David Bristow awaiting the winner. The National Over 60s Men’s Pairs sees John Maury and partner playing Richard White and partner from Boston, with the winner playing Gerald Pask. Terry Curran and Dave Chandley play against Paul Flatters and his partner from Boston. In the National Two Bowls Singles, David Bristow beat Tracy Nunn (Horncastle) 21-12 and once again plays Jonathan West in the next round. Paul Roberts and Trevor Bannister meet again in this event and Paul Oke faces Ian Clark from Boston. Two matches have already been played in the County Singles qualification. Paul Oke started his match in sparkling form against Trevor Bannister, taking a 7-2 lead after the sixth end. But all Trevor’s experience came to the fore as he steadily regained control and finished strongly to win 21-14. In the second match, Gerald Pask went 4-2 up against David Bristow, however he wasn’t able to stem the flow of some heavy scoring, losing 9-21.